Game Preview: Barrie Colts vs Mississauga Steelheads. 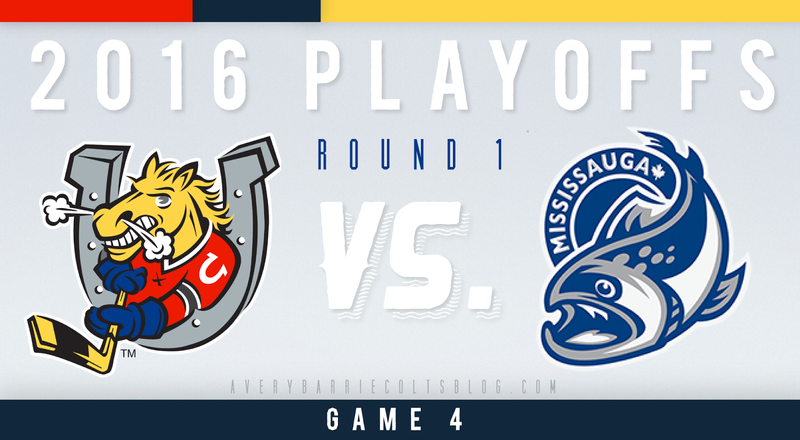 (Game 4) #OHL - Very Barrie Colts | A website covering the Barrie Colts of the OHL. Tonight is game 4 or the Eastern Conference Quarter Finals between the Barrie Colts and the Mississauga Steelheads. The Steelheads currently have a 2-1 lead in the series following a 4-3 win in double overtime this past Tuesday night. Mississauga was the stronger team generating 38 shots on goal. The also were able to capitalize on 2 of 6 power play opportunities and had a slight edge in face off wins winning 44 of 84. All 3 goals from Barrie came from near the hash marks in the offensive zone circles. The Colts were only able to go 1 for 5 on the power play. Colts will need to find a way to look stronger on the man advantage. Yesterday it was mentioned by Gene Pereira on Twitter that Mackenzie Blackwood would be a game time decision for Game 4. Here is what Gene was told by Head Coach Dale Hawerchuk. Colts head coach Dale Hawerchuk says Blackwood suffered a bruised tailbone and was still sore from the goal-crease crash on Tuesday night. So the question is: Are the Colts better off playing a their top goalie who is dealing with a bruise or should they look to their backup to try and see if maybe he can help get the team going? It really depends on how bad Blackwood feels however backup David Ovsjannikov has been great with the Colts all season and was successful in his one meeting with the Trout this season. Here are some numbers. With the Colts, Ovsjannikov has a 12-5-0-3 record. He posted a 2.97 GAA and .915 SAV% with 1 shutout. Also, Ovsjannikov started for the Barrie Colts in the final meeting in the reg. season. Colts won 8-0. David stopped all 27 shots. And who knows, maybe with David in goal the Colts might get some new life. And though you never want a starting goalie to go down, especially in the post season, for the Colts it doesn't mean the end of the season like many are suggesting if Mac does end up sitting. Keys to Success: Colts need to play 60 minutes. They need to be better in their end. Lots of lazy plays and bad turnovers have cost them all series. Also, star players are going to need to start putting up some points. The Steelheads have done a good job matching lines and making sure that Mangiapane's line goes up against the LaBlanc line. LaBlanc has done a great job cancelling out Mangiapane and the coaching staff might want to look into a way of breaking that matchup apart by either mixing up lines a little or trying to catch the trout with quick changes on the fly. It might even work randomly adding MAngiapane to other lines randomly with hopes of trying to mess up their line matching. They will also need to keep getting pucks on net. They seem to have had luck scoring from the circles so that might be a place to try and get shots off and to move the puck. A win for the Colts will tie this series and hopefully give them some energy and confidence headed back to Game 5 in Barrie this Saturday. Remember, they have home ice advantage which they can get back with a win tonight. The puck is scheduled to drop shortly after 7:00 tonight!